With the 2019 WHL Playoffs set to begin Friday, March 22, WHL.ca provides a look in at each of the eight head-to-head matchups across the league. With a general introduction, vital statistics and keys to the series, we’ve got everything you need to know heading into the 2019 WHL Playoffs. Plus, we will kick it up a notch with a highlight reel featuring key moments from the head-to-head season series. In our second of eight opening round 2019 WHL Playoffs previews, we examine the Vancouver Giants and the Seattle Thunderbirds. I know what you’re thinking – those poor Seattle Thunderbirds have to face the top team in the Western Conference. But let’s pause for a second. Aside from the Vancouver Giants – the aforementioned top team in the WHL’s Western Conference – there were two teams in the Western Conference that finished the 2018-19 WHL Regular Season playing at the peak of their game. The Spokane Chiefs went 8-2-0-0 to collect 16 points down the stretch and surged into second place in the U.S. Division. Meanwhile the Thunderbirds soared to a 7-1-1-1 mark over the course of their final 10 games, locking down the final wild card position and knocking off the third-place Portland Winterhawks on the final night of the regular season. If there is one thing that history has shown us over the years, critical to success come spring hockey is peaking at the right time. Let’s just say winning seven of 10 games to finish the regular season qualifies as getting your game in the right place at the right time. Of those final 10 games, the Thunderbirds faced nine opponents that finished ahead of them in the standings – the Winterhawks (three times), the Tri-City Americans (twice), the Giants, the Everett Silvertips (twice), the Victoria Royals and the Kamloops Blazers. So, that impressive run can’t even be chalked up to having faced easy competition. It is so easy to write off a wild card team come playoff time, but this series is one that should generate true intrigue. Over the course of a four-game regular season series, the Giants and Thunderbirds split things right down the middle. The Thunderbirds won both games in Vancouver – a 3-1 triumph on September 28 and a 5-1 victory on October 27. The Giants won both games in Seattle – 4-2 on November 21 and 5-1 on March 12. If you haven’t already done the math, the Giants scored 11 goals and the Thunderbirds scored 11 goals. Cool, cool, cool. Suddenly, this isn’t looking like such a sure thing for the assumed favourite. No matter how you slice it, this series sets up to pit two of the great stories from around the WHL in a head-to-head showdown as the 2019 WHL Playoffs begin. On one side, you have an organization under the new leadership of first-year General Manager Barclay Parneta and new-to-Vancouver Head Coach Michael Dyck laying claim to its first B.C. Division title since 2009-10. A significant contributor to that success comes in the form of affable defenceman Bowen Byram – a 2019 NHL Draft Prospect – who just happened to set a WHL record for overtime goals in a season and finished second in Giants team scoring along the way. On the other side, you have a Club also under new leadership, with General Manager Bil La Forge having done commendable work in his first year at the helm of the Thunderbirds. Meanwhile, second-year Head Coach Matt O’Dette has guided his squad to consecutive playoff appearances in the wake of winning the 2017 WHL Championship. Junior hockey fans around the country all know the challenges that a team faces after winning a title – go ahead and ask the Swift Current Broncos, if you’re unfamiliar. Both teams boast NHL prospects, as well as players expecting to hear their names called at the 2019 NHL Draft come June in Vancouver. Calgary Flames prospect Milos Roman, Washington Capitals prospect Alex Kannok Leipert, and Arizona Coyotes prospect David Tendeck headline the group for the Giants, while Montreal Canadiens prospect Jarret Tyszka leads the Thunderbirds.
.@WHLGiants & @SeattleTbirds prepare for border battle to open 2019 #WHLPlayoffs. First Place – B.C. Division Standing Fifth Place – U.S.
Special Teams Dominance: You’ll hear it over and over from countless coaches – if you can win the special teams battle, there’s a good chance you will win the game. Vancouver has been nothing short of stellar both on the power play and penalty kill this season, ranked fourth and second, respectively. Going up against the 20th-ranked Thunderbirds penalty kill will surely be an area of focus, particularly given the fact Seattle was the most penalized team through the 2018-19 WHL Regular Season with 1,046 penalty minutes. Shut down Bowen Byram: The sophomore product of Cranbrook, B.C., has been the ultimate catalyst for the Giants all season long. From scoring key goals in key moments, to playing a vital role as a part of the Giants third-ranked defence (with only 162 goals against this season) and their elite special teams, the Giants tend to go as the shifty blueliner does. If Byram has his way, expect the Giants to breeze on through the Thunderbirds. If Seattle can find a way to contain the smooth-skating defender, we’re looking at a completely different game. C Jadon Joseph (22-31–53): Moved twice ahead of the 2019 WHL Trade Deadline, Joseph has found himself in a nice spot on the West Coast. In 32 games since joining the G-Men, the 19-year-old product of Sherwood Park, Alta., has taken on a valuable two-way role and produced 28 points (10G-18A) along the way. He brings with him extensive experience from two deep runs into the WHL Playoffs as a member of the Lethbridge Hurricanes – 20 games and 16 games in 2017 and 2018, respectively. LW Nolan Volcan (27-30–57): In so many ways the heart and soul of this T-Birds squad, Volcan is one of the few remaining holdovers from Seattle’s 2017 WHL Championship crew. Having previously served in more of a checking role, the 20-year-old product of Edmonton has grown into a well-rounded player over the final two years of his WHL career, producing 133 points (59G-74A) over 128 games. Once again, 49 games of WHL Playoff experience is nothing to brush off. Dallas Hines (8-18–26): The 6-foot-3, 196-pound product of Marwayne, Alta., is sure to be hungry as he makes his WHL Playoff debut in this his final WHL season. Selected in the fifth round (97th) of the 2013 WHL Bantam Draft by the Kootenay ICE, Hines logged 221 games in Cranbrook before the Giants added him in an effort to bolster the backend prior to the 2019 WHL Trade Deadline. Now, the meat-and-potatoes rearguard will get a chance to play into April for the first time in his WHL career. Jake Lee (3-21–24): The 6-foot-2, 216-pound product of Sherwood Park, Alta., finds himself ranked 78th by NHL Central Scouting ahead of the 2019 NHL Draft, and a strong performance come the 2019 WHL Playoffs will go a long way to improving his draft stock. Though he only played two games, Lee was with the Thunderbirds as a 15-year-old during their run to the 2017 WHL Championship. At the risk of sounding like a broken record, experience matters this time of year. David Tendeck (38 GP, 24-10-2-1, 2.48 GAA, .911 SV%, 4 SO): The 19-year-old product of North Vancouver, B.C., made three appearances against the Thunderbirds in the season series, going 1-2-0-0 along the way. Over the entire season, he dressed in 38 games while running mate Trent Miner saw action in 32 contests. Tendeck is the veteran and likely stands to get the ball first. Roddy Ross (25 GP, 16-5-1-2, 2.76 GAA, .919 SV%): Part of the Thunderbirds stellar play during the second half can be credited to Ross, an 18-year-old product of Meadow Lake, Sask., who signed a WHL Standard Player Agreement in order to join Seattle on January 1, the same day that veteran netminder Liam Hughes was dealt to the Lethbridge Hurricanes. The real test comes now as Ross faces the pressure of the WHL post-season. It has been a long time since Giants fans saw anything beyond the first round of the WHL Playoffs. In fact, the last time Vancouver advanced beyond the first round was during the 2010 WHL Playoffs, which marked the second consecutive year they were eliminated during the WHL’s Western Conference Championship. The G-Men came close in 2018, falling to the Victoria Royals in seven games. Can they get over that first-round hump in 2019? Is a return to the WHL Championship for the first time since 2007 in store for fans in the Lower Mainland? 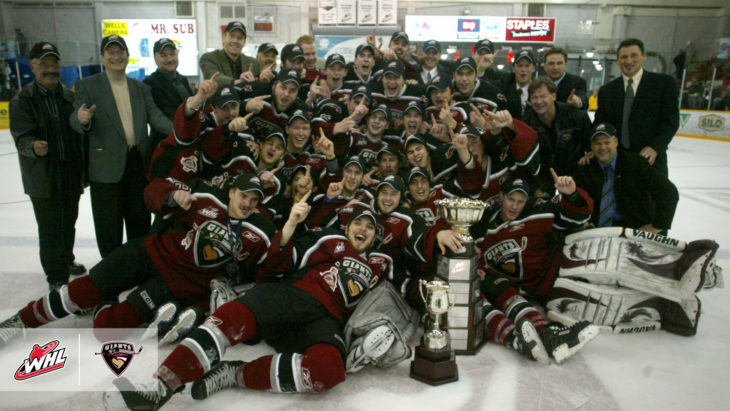 Can the Giants win the second WHL Championship in franchise history? One might say WHL fans in Seattle have been somewhat spoiled in recent seasons. In 2016, the Thunderbirds made it to Game 5 of the WHL Championship before falling to the high-powered Brandon Wheat Kings. Sure, no title, but an appearance in the championship, nonetheless. One year later, led by Mathew Barzal and Scott Eansor, the Thunderbirds returned to the WHL Championship to knock off the Regina Pats in Game 6, claiming the first championship in the 40 years of the franchise. Last year marked a step back as the T-Birds fell in five games to the Everett Silvertips during the first round, but a step back was expected in the wake of the 2017 championship. This marks the seventh straight post-season appearance for Seattle, and fans love every second of it.